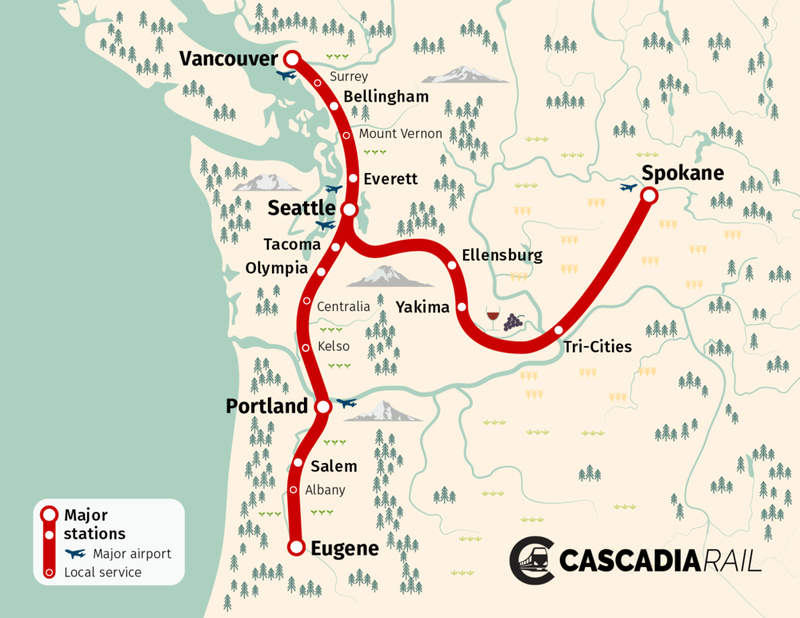 As first reported by the urbanist - On January 15th, 2019, just one day after being back in session, Jay Inslee and Washington State Legislature Democrats introduced new legislation that would create and fund a new Cascadia high speed rail authority. The bill would provide $3.25 million dollars, with an additional $250,000 also available if private parties (e.g., Local governments, Microsoft or Amazon) provide additional funding, in biennial appropriations through 2021 to establish an authority in partnership with the State of Oregon and Province of British Columbia, making the vision of a one hour train ride from Seattle, Washington to Portland, Oregon or Vancouver, British Columbia closer to a reality. The opening of the legislative session was January 14th 2019, and Democratic senators pushed quickly to introduce the legislation. The bill was introduced by Senator Steve Hobbs, D-Lake Stevens, who was was selected this week to again serve as chairman of the Senate Transportation Committee. Hobbs also retained his roles on the Senate’s newly named Energy, Climate & Technology Committee and on the Financial Institutions, Economic Development & Trade Committees. Hobbs was one of the key architects of the state’s historic and comprehensive transportation investment package in 2015. The interstate high-speed rail authority would be charged with developing an organizational structure that operates harmoniously across two states, a province, and an international boundary. The structure would need to address issues like governance, operations, contracting requirements, jurisdictional laws and regulations, and the powers of the authority. The authority would begin to engage with communities that would potentially be impacted, and begin carrying out an environmental impact review and study, a key step to getting approval for Cascadia High Speed Rail, and a requirement of the Federal Railroad Administration. A sister process would be needed north of the border in British Columbia. Reports from the newly created Cascadia High Speed Rail authority will be submitted by June 30th, 2020 on any needed addendums, agreements, regulations or laws that would be needed to make the high speed corridor a reality.. The authority will build upon earlier reports from the Washington DOT, released in 2018, and a business case study, which is currently in development, and ensure that whatever high-speed rail technology is ultimately chosen will be capable of reaching at least 250 miles per hour at top speed. The move comes upon large victories for high speed rail in 2017 and 2018, when the state legislature committed $1.2 million–of which was $750,000 in direct state grants–to a business case study for high-speed rail from Vancouver, British Columbia to Portland. The 76 page study released in December of 2017, commisioned by the Washington Department of Transportation - examined three different types of technology, including high speed rail – which tops out at 365km/hr (226mph), maglev 430-600km/hr (267-330mph) and hyperloop (unknown?? ), and looked at potential routes, costs, stations locations, costs, ridership and how to collaborate across an international border. Since then, the consultant for the state has been earnestly working on the study, which is due for completion by the of June. The business case study will identify potential station locations and how communities along the rail line might be impacted and affected. This will include examining service levels, needs, ridership, construction costs, financing options, operations and fares. An interstate advisory group was commissioned as part of the study. So far two meetings have been held to guide the study and corridor planning process. The advisory group also urged consultants to consider how high-speed rail could affect greenhouse gas emissions, analyze social equity in corridor planning, and model how far riders would travel to access high-speed rail. The business case study builds upon an earlier feasibility study that was completed in late 2017. The initial feasibility study suggested that Cascadia high-speed rail would be economically viable. While the $3.25 million dollars is a great place to start from, at $1.62 million per year, it will only allow for an staff of around ten hired positions to do the initial reports, studies, and to begin to build relationships with Oregon and British Columbia - a position from which it will need to grow if the conditions continue to look favorable. As reported by the Urbanist - If the business case study is anything to judge by, the State of Oregon and Province of British Columbia are in line to add money to the pot, increasing the two-year startup budget for the interstate high-speed rail authority. Last year, Oregon promised to pitch in $200,000 while British Columbia committed another $300,000 (in Canadian dollars). Microsoft also joined the team with $300,000 in private funding for the business case study after contributing another $200,000 for initial feasibility study the year prior. Results of funding for the bill will likely be available by April, towards the end of the new house session.